It’s someone else’s baby, people. Get over it. I, for one, have not been waiting expectantly for the last week for Kate to give birth to the royal baby. But thankfully, the little prince has arrived so now I can stop seeing inane headlines like, Top 10 parenting tips for Prince William and Kate (It goes by fast — enjoy it! ), David Beckham’s parenting advice to Prince William and Kate Middleton (name him David), and my personal favourite, Snooki’s advice for Kate on new motherhood (as if Kate would take advice from someone who refers to her baby as a “royal golden nugget”). Where, oh where is the tongue-in-cheek column urging the new parents to dangle the wee nugget from the balcony for fun? 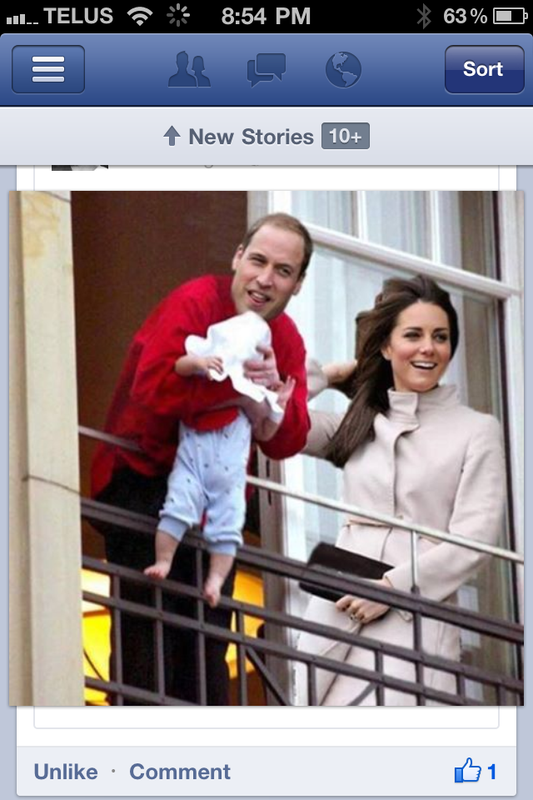 Will and Kate introduce the royal golden nugget, named after David Beckham, to the world on Fakebook. Why a blanket on his head? Perhaps to hide the red hair. I’m not sure if I’m getting my point across so I’ll rephrase: Why do so many people care so much about someone else’s bawling, drooling bundle of joy, to the extent that there’s ridiculous online speculation about what he’ll be named, how his parents will raise him and whether he’ll have a “normal” upbringing (e.g. turn out more like Harry). I know as a culture we tend to obsess about celebrities’ kids, talking about Apple and Moses with friends as if we actually know them (and Gwyneth, natch). And tabloids now dedicate a two-page spread to tracking the fashions and playdates of stars’ progeny, sinking so low as to pit these wee tots against one another in Who Wore it Better? It’s all so… weird. One tweet summed up Royal Baby Watch perfectly: BREAKING: Millions of British Have Nothing to Do, with a photo of the throng waiting outside the hospital for news of the birth. Poor Kate. I’m sure all she wants to do is sit in her housecoat and cry while the wee prince turns her fun bags into tender no-go zones, but instead she has to look fabulous when leaving the hospital. And Will is probably dying to sneak out to the pub with Harry for beers, but no. He has to change his first diaper. I mean, c’mon. 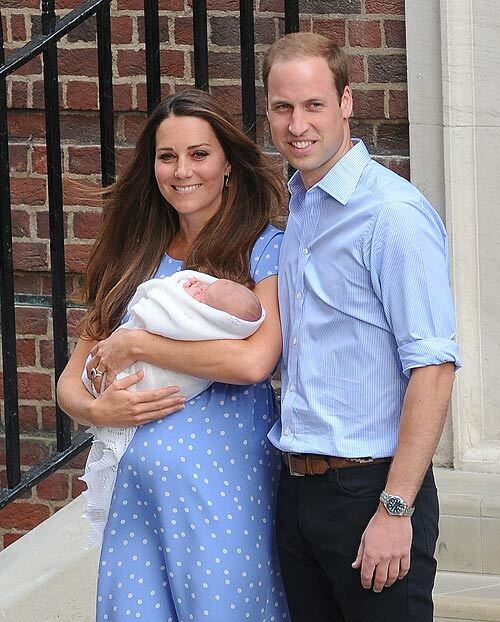 Who looks like this the day after giving birth? Must be one of the royal impersonators. It will go on now for days, months, years. He-who-at-some-point-will-be-named will make front page news when he attends a polo match with Dad, turns a week old, pretty much every time he burps and sharts (watch out for the poonamis, Kate — they’re messy). And people will eat it up and feed the monarch media machine. So please, let’s all get over it, stop speculating and do something practical. Send Kate some baby wipes… and a Diaper Genie. This entry was posted in Parenting and tagged newborn prince, parenting tips for Will and Kate, royal baby, royal golden nugget, so over the royal birth. Bookmark the permalink. I was really excited about the birth of my future head of state – the monarchy is central to my country’s history and I’m proud to be a member of the commonwealth. I think it’s unfair to compare celebrity-worship and obsession with the the pride having to do with the continuation of one’s culture. Prince George will always have tremendous expectation to live up to (I wouldn’t wish his fate on any child), but that expectation comes with the power to buoy a people.